Dr. Drabant is the Hospital Director and practice owner of Riverdale Animal Hospital. He obtained his Doctor of Veterinary Medicine degree in Hungary. Dr. Drabant attends seminars and international veterinary conferences regularly to update his knowledge in the current issues and developments in small animal and exotic medicine. He attended trainings in orthopedic surgeries and ultrasonography and always updates his skills and knowledge to conform with the current trends in these fields. Dr. Drabant is a very approachable and accommodating person. He speaks fluent English, Hungarian and Spanish languages. Dr. Elizabeth, as she is popularly called, was born in St. Boniface, Manitoba. 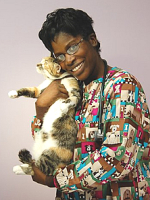 She moved to Nigeria for a while where she obtained her doctor of Veterinary Medicine from the University of Nigeria. She has been practicing in Ontario since 1998. Her interests include internal medicine, pain management and dentistry. She is a firm believer in client education that focuses on teaching clients on disease prevention. On a personal note, Dr. Elizabeth and her husband Izu, who is also a veterinarian love to spend time with their twins. She enjoys traveling with her family and is involved in the children’s ministry in her local church. 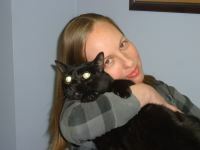 Jolene has been working in this field for over fifteen years and enjoys working with animals very much. She obtained an Animal Science Diploma from Thompson Education, and has attended and completed multiple different seminars and training's. 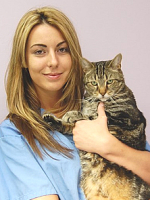 To mention a few, she has training in Critical Care and Pain Management in Small Animals, Dentistry and parasitology. Aside from being a Veterinary Technician, Jolene is also a Veterinary Nutritional Advocate of Hills. In her spare time she loves spending time with her dogs Ruckus and Angel. Dr. Salama graduated in 1975 from Cairo Veterinary School. He has practiced in different parts of the globe including the United Kingdom, Egypt, France and finally stopping in Canada in 1995. He has been with the Riverdale Animal Hospital team since the hospital was established. He has various trainings in the field of veterinary medicine and usually attends conferences to update himself on current developments in veterinary medicine especially in Ultrasonography and Exotic Medicine. 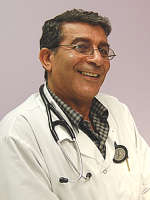 Dr.Salama speaks fluent Arabic, English and French. Szilvia has been working with animals for over twelve years. She started working in shelters at a young age and then joined us in 2011. She has a special love for Bernese Mountain dogs which she has had all her life. Brigitte is the newest edition to our team. She has a passion for pet care and customer service. She enjoys spending her free time with her dog Chico a Border Collie/ Wired Haired Terrier mix.